Schindler, D. W., & W.F. Donahue (2006). "An impending water crisis in Canada's western prairie provinces." PNAS 103(19): 7210-7216. Although this paper deals solely with the Western Prarie Provinces (WPP) some of the same implications of warming climate may be found in the Pacific Northwest. -Climate proxies such as tree rings and salinity-sensitive diatoms have shown that climate during the 20th century was moist compared to previous centuries where drought had occurred. This is the same for the western U.S.
-Even in the 20th century Evapotranspiration exceeded average precipitation in the southern parts of the WPP. -The study analyzed annual air temps back to 1925 and chose sites away from urban “heat islands”. Found that most sites had warmed 1-4 degrees C in the past 80-118 years with much of the increase since 1970. -Half of the sites currently receive 14-24% less total annual precipitation than at the beginning of the period of record and none had experienced increases. -In stream flow needs are greatest in the summer as a result of warm water, low 02 and coldwater fish fauna. -There has been a decline in stream flows unlike the increase in flows seen in Eurasia. This could be due partly to damming and human withdrawals. 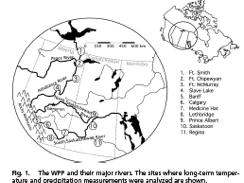 -This paper is scary with the percentages of decreased flows seen in the major rivers of the WPP during the summer months – greatest since 1970’s. -Predicted increases in temp predict increases in evapotranspiration of up to 55% in some WPP regions. The trend has been for declining or stable precipitation as well which is far less then the predicted increases in evapotranspiration. -Glacial wasting in the Eastern Rocky mountains has advanced enough that glacial melt is now declining. -Glaciers of GNP are said to disappear by 2030. There are some other figures of rates for other areas here too. -Roughly 70% of the wetlands of southern WPP have been drained or destroyed and declining water supplies to the peatlands may impair carbon fixation and increase decomposition rates. The potential of forest fires and use of the land during extreme doughts are much greater now than before and in a warmer climate which will release CO2 and methane to the atmosphere and create an unprecedented water crisis. -There will also be increased eutrophication of lakes and rivers as they dry up which corresponds to an increase in waterborn pathogens like Giardia etc which need expensive technologies to ensure their removal. Agriculture can be as source of these protozoan’s. -This paper ended with a good synopsis of the problems inherent in regulating large watersheds and the steps that should be taken. It seems an applicable study to many other regions of the world, and perhaps the Northwest as well. -I don’t have any specific questions, but perhaps would like your viewpoint on how much you believe the concepts in this paper apply to my research and the Northwest in general. We do have the Columbia as a major source of water and I don’t see that drying up anytime soon, but I agree we should take measures to regulate water use better. Papers of interest Cited – Some good ones on possible future water shortages worldwide. Unfortunately titles of the papers are not listed but I’ve highlighted the ones that appear in parts of the text I could relate back to my research.